Galaxy Note3: How do I take a Rich tone (HDR) Shot? 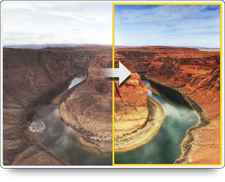 The Rich Tone or High Dynamic Range (HDR) photo option lets you capture better-looking photos, which are richer in color and brighter. To turn the Rich Tone feature on, with the camera application open, touch Mode and then touch the Rich tone(HDR) thumbnail. NOTE: To view all photo modes at once, touch Mode and then touch to switch to a grid view. Aim your device at the scene and touch the camera shutter button. For best results, hold the device steady while capturing photos. The device will capture three photos at different exposure levels and combine them into a single photo. Rich Tone works best when capturing landscapes, portraits in sunlight, and low-light/backlight scenes. Galaxy Note3: How do I take a Panorama photo?